On April 21st, as part of Earth Day 2018, thousands of shoppers took part in the ‘Shop and Drop’ nationwide day of action against the plague of supermarket plastic packaging. One year on, Sick of Plasic is diving into the next wave of action with the launch of an online platform for Sick of Plastic local actions. 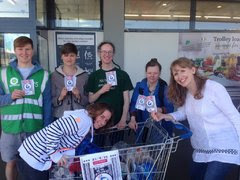 Last year, over 400 people volunteered with more than 50 local organisers taking the reins to build momentum on tackling plastic in their local supermarkets. Now, we’ve made it super easy for you to do the same, at anytime, at any supermarket. Saturday April 13th is the nationwide kick-off event – marking the beginning of a wave of community-led 'Shop and Drop' supermarket actions. Let’s build on the momentum created last year and increase the local action in our communities so that supermarkets are targeted on a regular basis – not just for one day a year. Supermarkets are simply not doing enough, but we know that public pressure works. Last year's action resulted in many supermarkets making small steps in the right direction, but we need to keep up the pressure so that they take more decisive action, faster. To ensure the managers of supermarkets wake up and realise that the public is sick and tired of this glut of unnecessary plastic, we need communities up and down the country to organise an action on April 13th. And this time, we don’t put down our tools on April 14th - we keep up the relentless action until we see results. The Sick of Plastic local actions platform provides all of the tools and resources you need to form a group in your area and organize your own day of action. Once you get set up, you will find all of the resources you need to run your own action. The 5 Step Guide outlines what to do between now and the 13th of April, and the resources section has all of the documents and posters you need to make your local Shop and Drop a success! Let's keep going until supermarkets #BreakFreeFromPlastic!